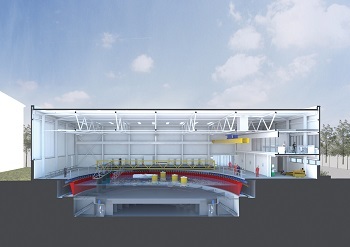 The All-Waters Combined Current and Wave Test Facility is operated by FloWave TT Ltd. (a wholly owned subsidiary of the University of Edinburgh) to serve the academic and industrial research sectors. The test tank provides large-scale model sea states (~1/20) for the physical modeling of wave and tidal energy devices and other marine structures. The test tank is unique in employing 168 wavemakers in a circular configuration across a 25m diameter with a 2m working depth. The generation of current is achieved through 28 flow drive units, each of which is equipped with a 1.7m diameter impeller. The circular tank configuration allows for the generation of complex directional wave fields combined with current from any relative direction. The facility is designed for waves up to 0.7m in height optimized at periods of 1-2s. Current velocities of 0.8m/s will be possible across the central test section (of ~15m diameter). The facility will be equipped with an onsite workshop and an extensive instrumentation suite including: wave gauges; acoustic Doppler velocimeters; and video motion capture. In order to facilitate the dry installation of test pieces the central floor section may be raised clear of the water. An overhead gantry allows for access and the mounting of instrumentation arrays. The All-Waters Facility will begin initial operations in late 2013. Future research applications include: large scale tests of arrays (wave and tidal); mooring and deployment studies; tidal array interactions; tidal system deployment; turbulence studies; wave structure interaction; and floating wind tow-out and mooring.